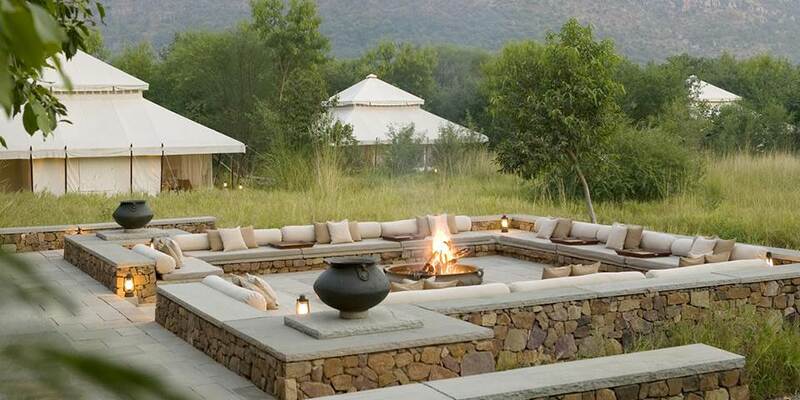 A beautiful wilderness camp of 10 tents, Aman –i-Khas can be reached easily from Delhi by train, plane or even helicopter. Located on the fringes of Ranthambore National Park in a rugged brushwood forest and surrounded by the starkly beautiful Aravali Hills it is open from October to April each year, the best season for wildlife spotting. The main focus here at Aman-i-Khas is on viewing wildlife. Open top vehicles transport guests on the twice daily guided excursions into the core of Ranthambore National Park for a wildlife safari. Now a wildlife sanctuary this park was once the hunting ground of the Maharajah of Jaipur. Deep in the core of the park guests have the best opportunity to spot leopards, hyenas, jungle cats and sloth bears. Tiger, that most elusive and desired sighting is not guaranteed but chances have improved with recent conservation efforts which have made the population more stable. Deer and gazelle roam the savannah, while lakes and waterholes are home to the Indian marsh crocodile. Bird watchers will not be disappointed as over 350 species have been sighted in the park. Guides are more than happy to take guests on guided nature walks in the outskirts of the park or venture further to visit the villages and forts in the area. 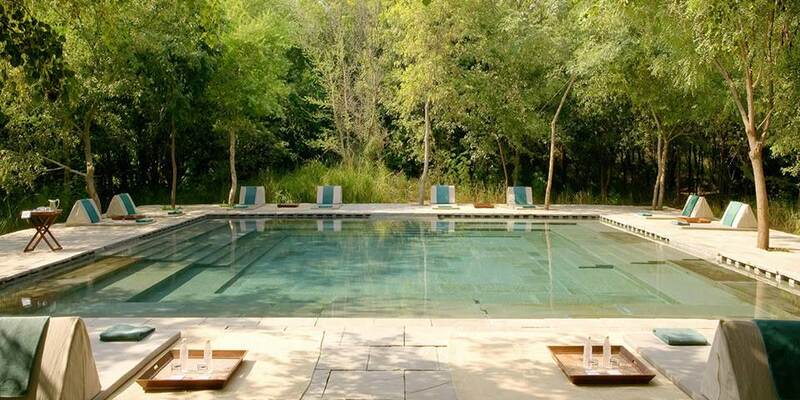 Back in the camp, guests can have a languorous dip in the pool, which is surrounded by a sunny terrace and grove of trees. 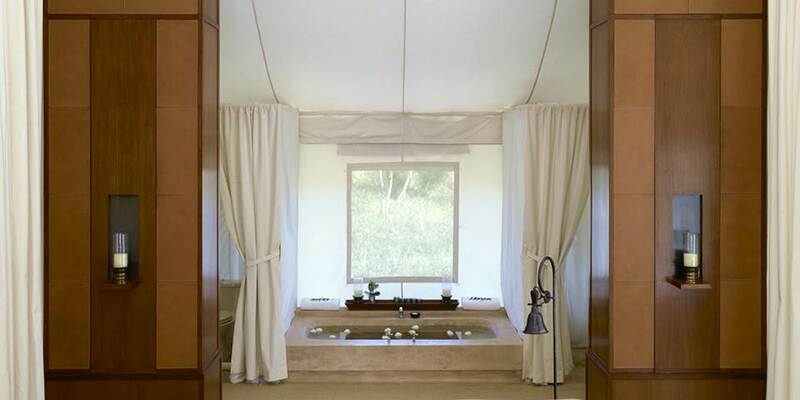 For total relaxation the Spa Tent has two treatment areas offering a range of therapies. 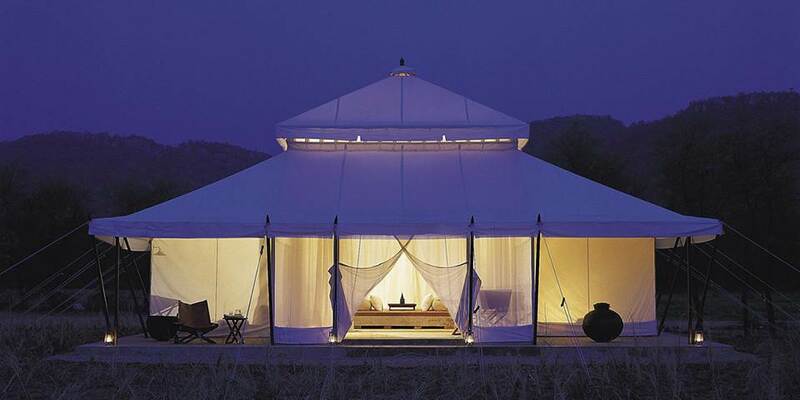 Dining at Aman-i-Khas is a delight, with the Dining Tent softly lit by lamps, fresh produce from the camp’s organic vegetable garden is used to cook delicious Indian and Western dishes. After dinner many guests gather around the roaring fire in the outdoor fireplace, sipping a drink under the stars talking about the day’s sightings. A truly magical experience in a magical setting. 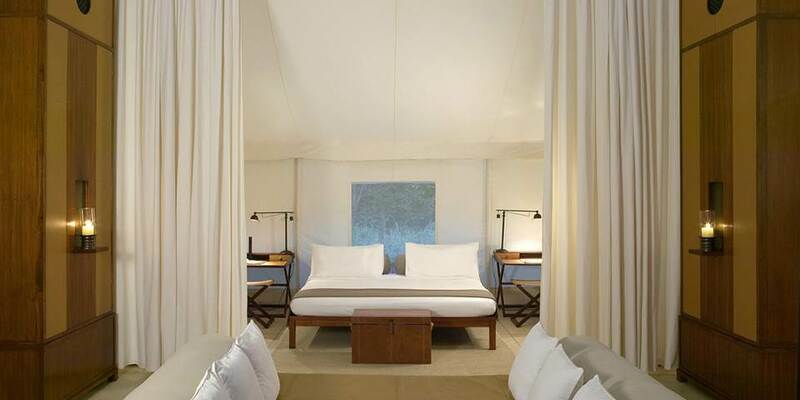 The accommodation here takes camping to a new level, each of the 10 luxurious tents is identical in style, with “rooms” separated by floating cotton drapes, echoing the rich Moghul travelling tents of bygone days. They are 108 square metres in size with entry through a screened area perfect for dining, the centre, with its soaring six-metre high canopy features an oversized day bed ideal for lounging. Three more sections open out from this area, the bedroom has a king size bed flanked by twin writing desks, a dressing area has abundant storage space and twin vanities, while the bathroom has every facility one could wish for including a soaking tub.